115 years is a long time for a skincare product to stick around but that’s the marvel of Shiseido’s Eudermine Revitalizing Essence – one of the oldest beauty products available on the retail shelves, albeit in an advanced formulation. Eudermine – a name derived from the Greek words for “good” (eu) and “skin” (derma) was created in 1897, based on the research of Dr. Nagayoshi Nagai from the Imperial University of Tokyo. It was Shiseido’s first cosmetic product (this is the only cosmetics company that started in pharmaceuticals) and the ruby red skin softening lotion originally came in a late-Victorian style bottle with eight cut facets and an ultra-feminine, flower-emblazoned label. In Japanese skincare, Eudermine took the place of “cosmetic water” – the first step of a beauty routine to moisturise and hydrate the complexion, usually followed by a “milky lotion” that “locks” water into the skin. Sounds a tad complicated I know, but would you argue with the women who, as a nation, have the most gorgeous skin in the world? 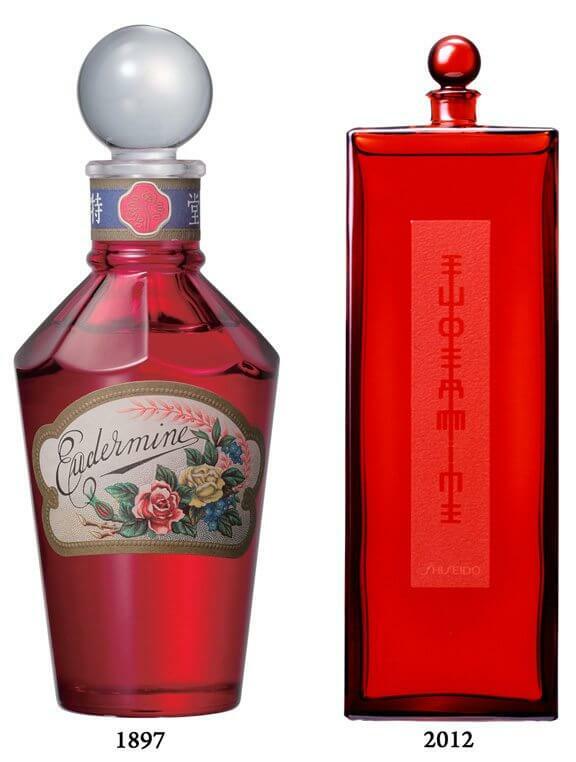 Which brings me to the fact that Eudermine is not a “toner” in the commonly used sense of the word. Rather, it performs like a lotion – smoothing and moisturising the complexion with a formula that responds to changes in the climate, keeping skin hydrated regardless of location or season. I normally bring it out when my skin is reeling from a stressful period, breaking out in red spots and dry spots. Eudermine normalises every irregularity with its thick, gelatinous consistency. It’s as soft as silk and leaves my skin feeling clean, cool and balanced. An added bonus: it smells like rain-washed peonies. Little wonder then that this “Red Water” (dubbed so for its scarlet containers) continues to be a bestseller worldwide. The current bottle – a minimalistic red flacon with a small spherical cap – was designed in 1997 by Serge Lutens to mark Eudermine’s 100-year anniversary. The name is written on the label using an angular font with a symmetrically mirrored coupling of the letters that makes them look like Japanese ideograms. However, if you would rather have the old school original from 1897, good news is at hand: Shiseido turns 140-years-old this year and to commemorate its anniversary the brand is reissuing the apothecary-style, 115-year-old bottle in a limited edition (US$60). And that’s not all: the retro flacon also comes with a set of limited-edition blotting papers that are currently available only in Japan. Plus, the outer carton is dressed up with an illustration by Ayao Yamana, a legendary Shiseido designer from the 60s and 70s. I am hoping they will re-issue other products and packaging designs from decades past, allowing us to experience the brand’s heritage. “Heritage” is a term that’s really overused these days but Shiseido has actually earned it! « Aishwarya Rai slims down but we are STILL obsessed by her weight!